Here’s a little plug for a site we have been using rather a lot recently at Bet72, 138.com , but when we speak to people about their offers many haven’t even heard of them. 138.com have actually been around for over a decade now but have recently shifted their focus to the UK market including a big sponsorship tie up with Watford. Maximum stake allowed is £/€10. After you have deposited into your account you must stake 1 qualifying bet. For example: If you stake £/€10 , you will receive a free £/€10 bet. Qualifying bets can only be placed on a win single or combo bets. System bets do not qualify. Qualifying single bets must be staked at odds of Evens (2.00) or over. Each selection in qualifying combo bets must be placed at odds of 2/5 (1.40) or over. The FREE BET can only be claimed once your qualifying bet have been settled. Available to all 138.com players over 18 years of age. So just click below to get started and do check out our OFFERS FOR ALL page for all the latest ongoing offers from these chaps too and trust us, there are plenty, including…. Miss by One? Get a Free Bet! Simply place a football accumulator of SIX teams or more and if only one team lets you down, we’ll refund your stake as a free bet! Offer applies to Sportsbook markets only. The Matched Bet Offer amount must be rolled-over 5 times prior to withdrawing the bonus or any bonus related winnings. All bets for rolling over the bonus must be on odds of at least 2.00. Non-qualifying bets can be placed, but they will not count towards completing the bonus roll-over requirement. One free bet per customer only. If a customer opens a duplicate 138.com account then we reserve the right to close the account and make any bets placed void. 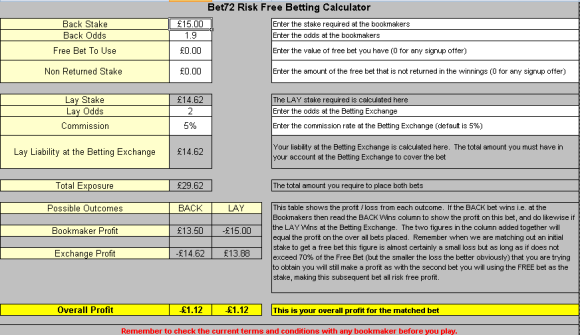 The Free Bet must be used in full and not split into separate bets. The free bet will only be valid for 30 days from when the bonus is issued. 138.com reserves the right to withhold any free bets if believed that the offer has been abused and/or where the terms of the offer are not fulfilled or any irregular betting patterns are found. 138.com decision is final. General Bonus Terms and Condition of 138.com apply. Fancy a free £10 Bet, well Come On then! And when you are done with that you can collect a free £25 over on their casino too. Add to that a very slick and smooth site, great support, quick withdrawals and a fantastic list of ongoing offers for existing users then it is safe to say your are going enjoy this one. So to make a start just click below and soon you will shouting Come On! To qualify you first need to open an account and deposit £10. You will then need to place a single sportsbook bet of £10 with minimum odds of 1.5 to qualify for a £10 free bet token. Within 24 hours of your qualifying bet being accepted you will be offered a £10 free bet token. You first bet placed must be on ComeOn Sports (sportsbook) markets. Casino is excluded from this offer. Here’s a name you will know, Setanta but did you know they had a betting outfit too, yes called SETANTABET funnily enough. And it gets better, look…. SetantaBet are offering a £/€10 Free Risk Free Bet* to all new accounts residing in the Republic of Ireland and United Kindom. To open your new account click the “Open New Account” link below and fill in your details. Simply place a £/€10 bet on a win single with odds of evens or greater. Email support@setantabet.com with your account username so we can issue you with your FREE £/€10 BET VOUCHER! The site is part of the JenningsBet (IOM) family of sites so shares the same skin of a website as some of our bookmakers at bet72…. Unfortunately we cannot get SETANTABET into Oddsmatcher at this time but with stacks of markets available it should be really easy to pick up some easy qualifying and cashout options. Or just drop us a line to info@bet72.com and we will be happy to send you some options overs. This offer is open to new accounts only. Existing players do not qualify. This offer is only valid for the first sports bet of £/€10 or more placed upon opening the account. If your first bet is not a winner, email support@setantabet.com and we will issue your free bet voucher. To qualify, bets placed must be win single, odds of evens or greater. These conditions also apply to your free bet. On receipt of email stating your username, we will verify that your first bet is not a winner and issue a voucher code within 48 hours. Free bet cannot be used in conjunction with Specials or any other offer. One free bet per customer only. If a customer opens a duplicate SetantaBet account then we reserve the right to close the account and make any bets placed void. SetantaBet reserves the right to withhold any free bets if believed that the offer has been abused and/or where the terms of the offer are not fulfilled or any irregular betting patterns are found. SetantaBet decision is final. SetantaBet reserves the right to withdraw this offer at any time, for whatever reason and without prior notice. SetantaBet reserves the right to alter these Terms & Conditions at any time without prior notice. Place a bet on any football match or selection of matches until January 1st 2017 and we will add an extra 25% to your winnings! Whether you are betting pre-match or in-play, sink your teeth into two of these juicy Profit Boosts every week! Roar when your teams score! From the Premier League to the Bundesliga, League Two to La Liga – it doesn’t matter what games you are betting on, we will boost your winnings! Simply place a bet of up to £25 via your mobile on a single selection to enjoy one weekly Profit Boost and then another bet of up to £25 on a multiple of three or more selections to get your second weekly boost. Deposits made via Skrill or Neteller are not eligible for the Free Bet. The ‘Football’ promotional period is from 12:00 Monday 5th December 2016 until 23.59 Sunday 1st January 2017. The time format for this document is GMT. Any bets placed outside this period will not be included in the promotion. Players can receive a maximum of two Profit Boosts each week throughout the promotional period. A maximum of eight profit boosts during the campaign period – per person/ account/ household or IP address is allowed. Each player will get two (2) 25% Profit Boosts each week on Football, meaning players can get up to 8 profit boost during the whole promotional period. Each player will get one (1) 25% Profit Boost each week to use on a single selection – and one (1) 25% Profit Boost per week to use on a multiple of 3 or more selections, meaning players can get up to 8 profit boost during the promotional period. Maximum Extra winnings of £500 from single bets apply. Maximum Extra Winnings of £5000 from multiple bets of 3 or more selections apply. Maximum stake of £25 from single bets apply. Maximum stake of £25 from multiple bets of 3 or more selections apply. Profit boosts placed on bets that are made void will not be returned. Cashed in bets do not qualify for this offer. The Profit Boosts are only available via mobile. Available on Pre-Match and Live bets. Extra winnings will be paid as cash. The General LeoVegas Bonus Terms and Conditions apply. General Terms and Conditions of the LeoVegas website apply. 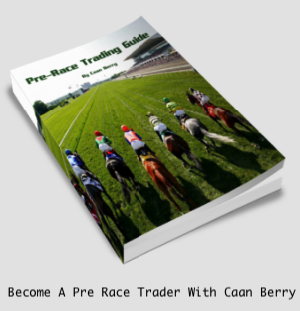 Make sure you fulfill the qualifying criteria for your Profit Boost. Whatever your views on the impeding EU Referendum there is at least one thing we can all agree on and that is some nice easy risk free profit from the vote as bookmaker Tonybet brings an offer that you really cannot lose, look…..
We have taken the unprecedented step of giving you unrivalled odds on LEAVE (Brexit) on the EU Referendum vote + £1 million in Risk-FREE bets. TonyBet is open for business on this market until 7pm UK time on Thursday night betting to a 100% margin, providing unrivalled odds. In addition, if you bet on Leave (Brexit) with us, and Remain wins, you will get your money back up to £20 pounds! Like we say you cannot lose on this one and indeed you can even lock in some guaranteed risk free profit before a vote is even cast using a very basic strategy of a simple BACK and LAY of the LEAVE outcome and a further LAY of REMAIN. 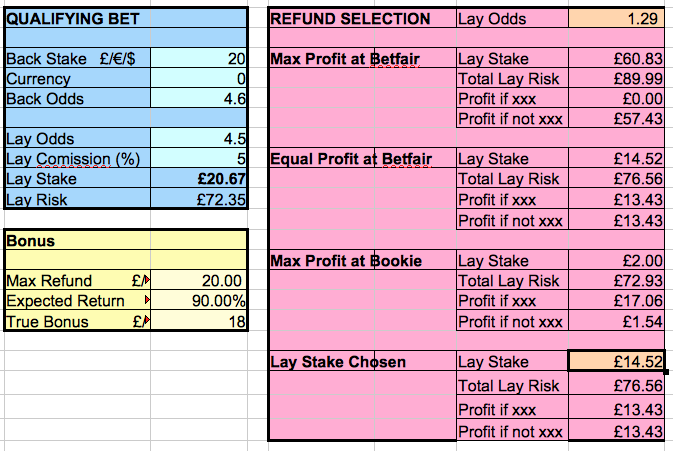 And using our every so handy Refund Spreadsheet (download here) we will even do all the calculations for you. At the time of typing LEAVE was priced at 4.60 with TONYBET & 4.50 to LAY on BETFAIR with REMAIN 1.29 to lay. 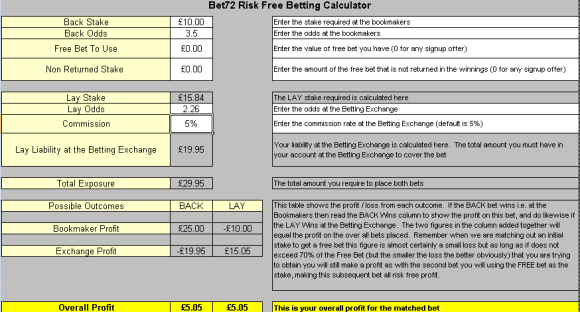 So just fill in spreadsheet with the odds at the time you are ready to bet, weight it one way or the other or just split the profit right down the middle (for £13.43 guaranteed profit). Just like the vote itself, the choice is yours…. Tonybet is a relatively new bookmaker to Bet72 but we have already picked up some decent profits from a number of their reload and existing user bonuses as well as their rather tasty sign up offer. Or you can ignore that and jump straight into the offer above. Either way it is £’s all the way. Just click below to get started…. Bayern Munich take on Arsenal in the Champions League on Wednesday 15th February – and we’ve got a fantastic In-Play bet offer to add to the excitement. Place a pre-match bet on the Bayern Munich v Arsenal game and we’ll give you a risk free In-Play bet to the same stake on the big match. To qualify for your risk free In-Play bet, simply place a bet before kick-off then, once the game starts, place another bet on any In-Play market. If your FIRST In-Play bet loses we will refund this stake, up to the same value as your largest pre-match bet (max refund £50*). Where more than one In-Play selection is placed on the same bet slip, the risk free bet will be deemed to be the one which is first on the bet slip. All bets must be paid for and placed in the usual way and any bets that are fully or partly Cashed Out, or edited using our Edit Bet feature, are excluded from this offer. As always, there’ll be plenty to choose from with over 70 In-Play markets available throughout the game including Next Goal, Match Goals, Match Corners, Half-Time Result, Full-Time Result and much more. With an extensive range of pre-match and In-Play markets and a fantastic In-Play bet offer, you can get great value on your Soccer betting at bet365. Just back / lay a selection on the game for upto £50 (pre match) for the lowest possible loss in the normal way. Remember if you win happy days, if not then the inplay bet will be refunded after the game, so there is no risk! Or you can lock in some risk free profit if you like. The key is to underlay the bet on the exchange so that if the bet does win you lose less at the exchange to have locked in a profit. 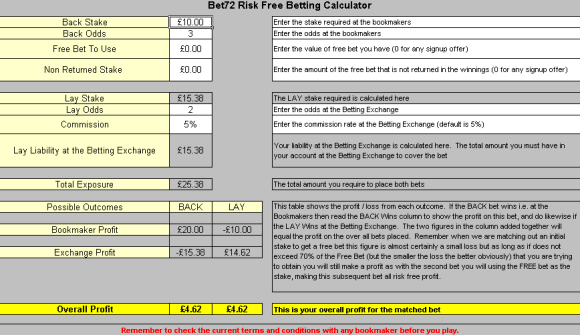 Or if the bet loses you will win something from the lay bet plus get the refund too to take you into profit. And if you are nervous of a goal whilst you are mid-bet, then don’t worry you can always place it at halftime. This will give you plenty of time to sort out your calculations! Talking of which, just calculate the lay stake in the same way you would a stake not returned free bet offer using the Bet72 Risk Free Calculator or sign up to our mailing list for a free copy of our matched betting spreadsheet as shown below. 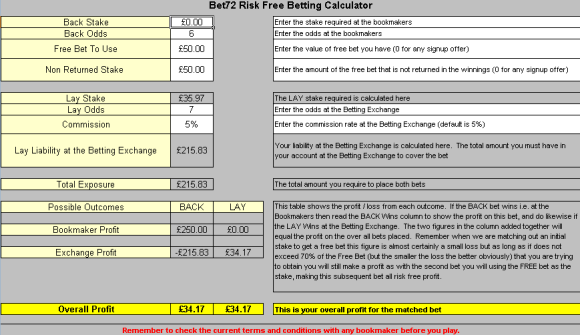 For an example of an underlay bet can be seen here…. As a rule just treat it as a Stake Not Returned free bet and look for higher odds to lock in more profit! 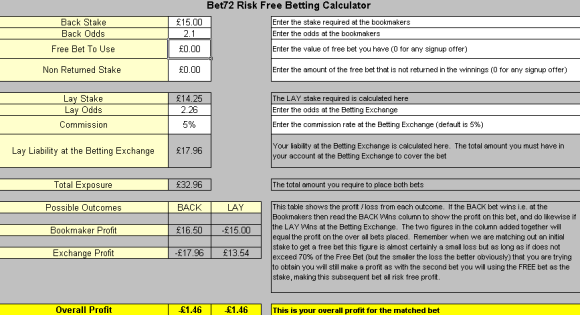 So even though the higher back / lay odds are not as close together, the overall profit is more. However you will need more money in your betting exchange account to cover the increased liability of laying at higher odds. These examples show the profit equalised across all outcome but of course you can weight the balance of the bet anyway you like if you favour a particular selection, it really doesn’t matter as either way this is all free money! Of course you will be needing a BET365 account for that, so you can grab yourself upto £200 (yes £200) sign up bonues too in the process. Note that ‘pre-match’ is defined as bets placed prior to kick-off of the Bayern Munich v Arsenal Champions League match, played on Wednesday 15th February 2017 and ‘In-Play’ is defined as any bet struck after the game has kicked off. Yes register and deposit right upto to kickoff (8:00PM 11/02/14) and you can grab both offers to make you an instant, well, Winner. – Bet must be placed pre-match. Live bets do not count. Singles only on match odds markets. Maximum stake on the enhanced odds is £10. A £3.59 profit whatever the outcome. Not only that but you will also get a FREE £25 bet too which you can then cash out for more risk free profit. So effectively you are getting paid to take the free bet! And naturally we have Winner added to our free odds finding software, Oddsmatcher, so finding all the bets you need is just a click of a mouse away. So what are you waiting for, come and be a Winner (well a double Winner actually), just click below to get started…. 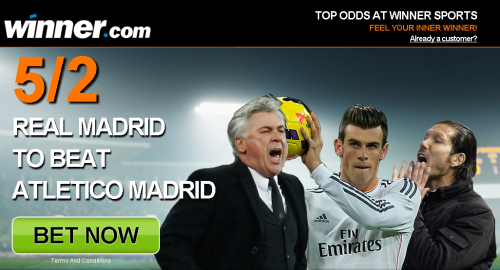 We are giving you 5/2 on Real Madrid to win (11/2/14). You won’t find odds this good anywhere else. At Winner, we always strive to offer amazing odds on all sports. To welcome new accounts, we are going even further. Do not use a Free Bet Token. Use real funds or you will not qualify. Bet must be placed pre-match. Live bets do not count. • The further winnings at the enhanced price will be credited within 48 hours. • For example, if you were to bet £10 on England to win at evens (2.00) and our enhanced odds offer was 2/1. If England win, you would be credited with £20 immediately after the bet is settled (winnings of £10). You would then get a further £10 credited to your account within 48 hours. • Duplicate accounts will not qualify for this Free Bet offer. Only ‘one new account offer’ per person, household address, email address, debit/credit card number, or IP address is allowed. • Winner reserves the right to amend, cancel, reclaim or refuse the award of any offer at its own discretion. • Offer is limited to one per person, per household, per computer, per e-mail address or per payment details. • In the case where multiple instances of the same bet have been placed, only the first bet will count towards the offer. • Due to the abuse of promotions, customers using Neteller or Moneybookers to deposit will not be eligible for this offer. • Only available to customers in the UK and Ireland. Nice and easy free tenner from Winner! • Applies to bet placed on Wednesday 31st July Only. • Maximum Free Bet £10 per customer. • One free bet per customer. Offer is limited to one per person, per household, per computer, per e-mail address or per payment details. • Wagers placed using Free bets do not count. Place a minimum £/€5 Fixed Odds Correct Score bet on the Notts County v Bury match before kick-off at 7.45pm on Friday 22nd February 2013. Once you have place the qualifying bet, we will give you a free £/€5 Fixed Odds Correct Score bet to use on any 3pm Premier League match on the 23rd of February 2013. 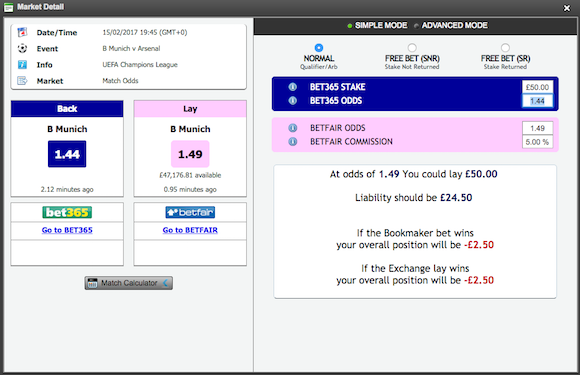 You’ll be able to see details of your free bet in the Free Bets section accessed through the header on the main site. Everyone is certainly a winner today as bookmaker Winner Sports has not one but two offers for all new account holders. 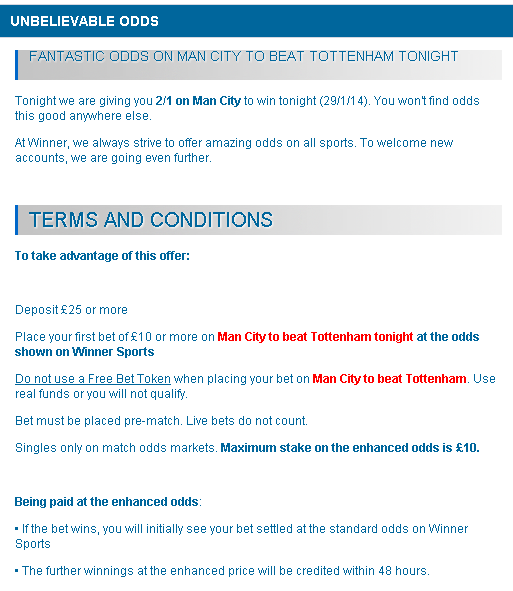 Yes register and deposit between 11AM on 29/1/14 right upto to kickoff and you can grab both offers to make you an instant, well, Winner. A £3.50 profit whatever the outcome.